The following policy will be followed by all members of Gunston Soccer Club. Cold weather is defined as any temperature that can negatively affect the body’s regulatory system. It is important to remember that temperatures do not have to be freezing to have this effect. Individuals engaged in sports activities in cold, wet or windy conditions are at risk for environmental cold injuries. • Determine the closest safe structures in advance of any activity. Safe structures include the nearest school building, a complete enclosure, or a fully enclosed metal vehicle with windows tightly closed. Press boxes, sheds, storage buildings, or dugouts will not provide adequate protection. • When thunder is heard, or a cloud-to-ground lightning bolt is seen, the thunderstorm is close enough to strike your location with lightning. Suspend outdoor activities and seek shelter immediately. • Select a distinctive, recognizable method to announce or signal the lightning warning and clear-the-area order, such as blasts of a whistle, public address announcement and a shouted command. • Estimate the amount of time required to safely evacuate, at a comfortable pace, to the designated shelter(s). Remember that lightning may strike as many as 10 miles from the rain that may accompany a thunderstorm. Given the different distances to shelter, the number of people present, and the variation in mobility of the people seeking shelter, suspend activities at the first sound of thunder or upon seeing a cloud-to-ground lightning strike. 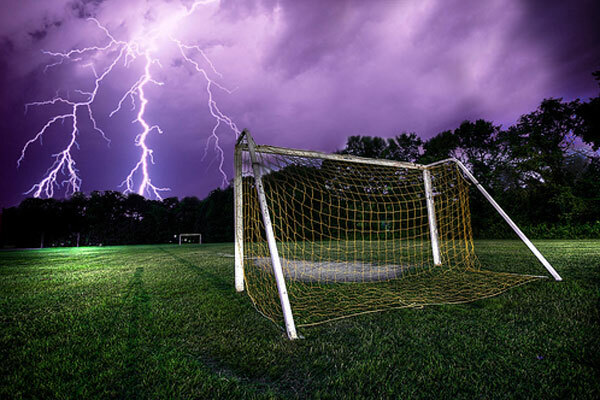 • Prior to athletic events, the athletic administrator or game manager must make sure that visiting coaches, school administrators, and officials are informed of the lightning safety guidelines in effect at the facility. • Inform participants and spectators when a thunderstorm watch is in effect. Tell them that play will be suspended as lightning approaches, what the clear-the-area signal is, where to go for safe shelter, and what routes to take as they evacuate the area. Prior to outdoor competitions, this should include a formal announcement over the public address system. • Designate one person who is responsible for monitoring the weather forecasts, watching for lightning and listening for thunder. The use of an inexpensive radio tuned to the all-weather or all-news radio station is recommended (bursts of static on the radio indicate lightning in the area). This person should have the authority to order that the clear-the-area signal be given or be in constant contact with the person who does have the authority. 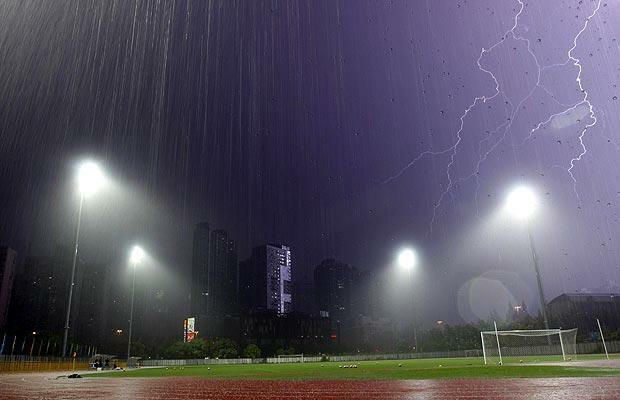 • Wait a minimum of 30 minutes from the last nearby lightning strike before resuming activities. Any subsequent thunder or lightning after the 30-minute count has started resets the clock and another 30-minute count begins. When thunder is heard and/or cloud-to-ground lightning is seen, immediate defensive action must be taken as participants and spectators are in immediate danger. The “clear-the-area signal” should be given as soon as thunder is heard or cloud-to-ground lightning is seen, especially when children or a large number of spectators are at risk. If you need assistance, call the safety section at 571-423-2010.